I managed to ride my bike to work twice last week. I need to get better at going to bed earlier and not hitting snooze twenty times so I’m not rushed and then forced to drive to get there on time. At any rate, the main reason I ride to work is for my health. But if I’m constantly breathing in the exhaust from every passing vehicle, might I not be doing myself more damage than I am doing myself good? 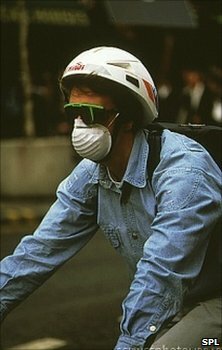 A recent study links riding in traffic with increased risk of a heart attack due to the pollution. Others show increased inflammation of the lungs from exhaust particulates. I find a bit of irony in this. By riding my bike, I’m not contributing to pollution and thus making it easier for others to breathe, but at the expense of making it harder for *me* to do so.